Brexit is set to hit people of colour the hardest, so why is nobody asking us what we think? The demographic of the People’s Vote march was notably different to other demos I have been on recently. The march saw between 300,000 to a million turn out (depending on who you speak to) and watching the marchers gather, I had a flashback to three months ago, when people flocked to the Home Office protest for the Stansted 15. 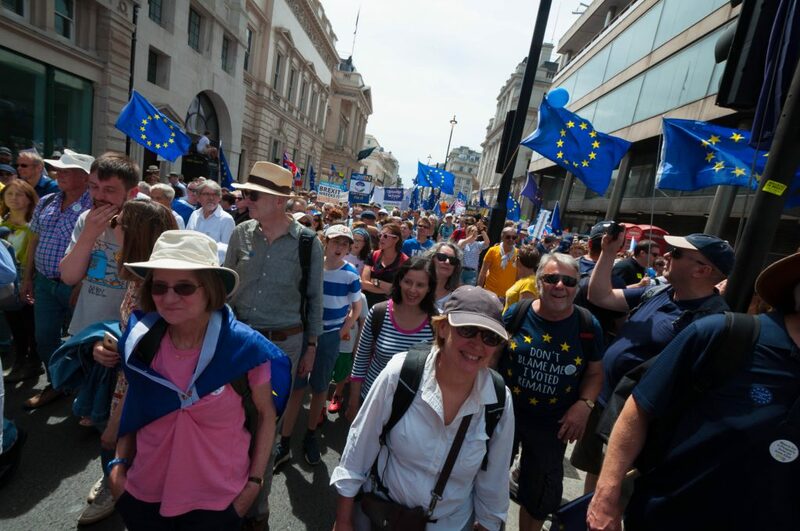 This was another issue tied to citizenship and immigration, but at the People’s Vote, there were many, many more white faces in the crowd. The anti-Brexit movement, to me, looks like a very white and middle class one – and I know many other people of colour feel the same way. But this seems paradoxical considering that Brexit will affect us as much as anyone else, and immigrants’ place in the country was so central to the initial debate. I spoke to campaigners, lobbyists and researchers to find out why. What’s at stake for people of colour economically? In short, a lot. gal-dem contributor Kimberly Mcintosh, a Senior Policy Officer at Runnymede Trust, says that Brexit is set to deliver a blow the economy – that GDP, a broad measure of a nation’s overall economic activity, will go down after we leave the EU. “There is no grand policy programme being put forward by anyone to counter that,” she adds. Maz Hedgehog, a 25-year-old Manchester-based poet, agrees that an isolationist Britain will make our lives more difficult economically: “People of colour tend to be poorer, and in more precarious work than our white counterparts,” she says. It’s also important to consider that single parents are at an increased likelihood of being black, and being women – for a number of reasons. “In the most recent Spring Statement by the Chancellor, benefits are still frozen, hitting single parents particularly hard,” Kimberly says. Research by Women for a People’s Vote found that women are also likely to lose out regarding healthcare and cost of living. While there’s no formal research on how Brexit will directly affect non-binary people, Maz says the stats usually follow a similar trend. Both Leave and Remain were, like any political movement, steeped in ideology. Remembering the fundamental symbolism of what Brexit means for many is key – the idea that some of the 17 million leavers voted for, surrounding immigration, and Britain’s place in the world. This idea was also related to the place of people of colour and migrants in the UK. Following the Brexit vote in June 2016, the UK saw the worst ever rise in recorded hate crime – with people of colour as the most common targets. But Kimberly points out that the stat is often reported as a retrospective fact, rather than being a strong predictor of what will likely happen after Brexit too: “Police are preparing for it to increase again when (and if) we leave”. For Maz, Brexit was a racist, xenophobic event. “Too many people voted Brexit because they wanted ‘our kind’ gone. “The hostile environment has already stolen so much from us, and Brexit-fuelled racist violence has changed and ruined so many lives. Even if it isn’t as economically disastrous as predicted, people of colour will be ever more endangered by this nativist, ethnocentric project, both materially and socially.” As much as it is about economic circumstance, Brexit is about concepts, and the symbolic and physical violence that can result. As we think about the big ideology and hate that threads itself through the Brexit conversation, Kimberly says we should also be careful to avoid London-centrism. “In towns across the country there are people of colour living in communities that are mostly white, as well as those where there was a high leave vote and high vote for UKIP. She caveats, “I think the UK’s treatment of non-white populations across the world will not be overly affected by Brexit itself. So is Brexit really an exceptional event? Yes and no. Arguably it’s not as exceptional as it’s often framed to be – and that’s actually a huge part of the problem. While it may be unjust, people of colour have faced similar injustices since the dawn of the very idea of citizenship. Dr Michaela Benson and Chantelle Lewis are two researchers working on the Brexit Brits Abroad project – conducting in-depth interviews with people of colour in the EU27 and looking at Brexit’s relationship with race. Michaela sees a certain level of selective outrage amongst Brexit protesters – where have they been hiding out, well – forever? But losing a form of citizenship seems to be a new experience to many middle-class white people. “Right from the beginning, the tone of those campaigns and how they were communicated through the press was like, we’re having our rights taken away from us. Isn’t this outrageous? Isn’t this terrible?” Michaela says. Michaela echoes Kimberly’s sentiment – conceptually and practically, “freedom of movement” isn’t something available to everyone. “It never was. It was rife with inequality,” she says, pointing to the Roma population, EU citizens who historically haven’t been allowed to stay in the places they’ve wanted to settle. “I think it’s about time that people educate themselves, and learn exactly why freedom of movement wasn’t some kind of some kind of utopian, wondrous thing that everyone could undertake. Today, as the UK treats the 29 March deadline with less punctuality than a second year essay, the conversation can feel hopeless. The Brexit deal will likely affect our everyday lives – from the economy to the NHS, travel and rights at work. It’s important to stay educated – it’s easy to be shut out of inaccessible conversations surrounding parliamentary politics. Organisations like My Life My Say and FullFact help break it down and there are also ways of mobilising around Brexit, like engaging with petitions, going on marches and writing to MPs about the Brexit outcome you want, and the policies you want to see. Meanwhile, as a longer project, it seems urgent to improve the way we talk, and push others talk, about immigration and solidarity.